When making the transition to competency-based professional development, organizational leaders must create a shared vision for their program. Support from key stakeholders within the organization as well as clear communication for how the program aligns with goals for the district are key to a successful implementation. 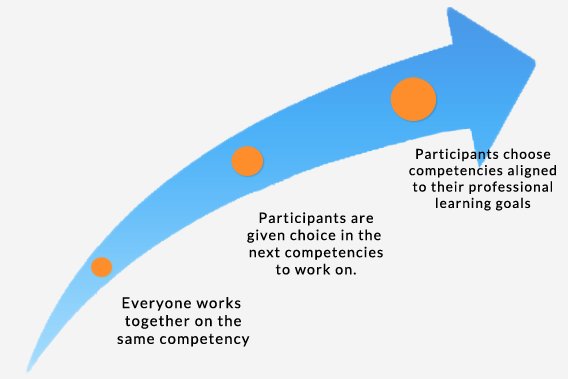 If your objective is to energize your educators, gain their trust and commitment, and provide direction across the organization, then you should bring together a team to create the organization’s vision for competency-based professional development. This vision, should not be created alone by one visionary in the organization. By working together as a team, more people will buy into the process and understand the steps of how they got to that vision, and then can work as a team to get to the end together. When you listen closely to each other, appreciate their hopes and attend to their needs, the best shared visions will come together and the team will end up being more committed than compliant in reaching the goals. Studies show that incentives can improve learning achievement. A growing number of organizations are rethinking their licensing and salary scales to provide a clear pathway for growth and career opportunities through competency-based professional learning. Educators are then motivated to continue to grow in these organizations because they have a clear pathway on how to reach their individual professional goals while receiving recognition, salary increases/stipends while growing as a professional educator. In addition, a growing number of states are recognizing micro-credentials for professional development credit and many higher education institutions offer teachers the opportunity to earn university credit for completed micro-credentials. Districts that provide CEUs, salary advancement, university credit, as well as professional recognition and leadership opportunities for teachers, all agree that these benefits motivate participation. Change takes time and effort, so it’s important to develop a phased approach to implementing competency-based professional development. Setting up an experimental pilot, where educators have a shared learning experience by working towards the same micro-credential, is a great way for leaders to understand the opportunities and challenges before launching a large-scale program across your organization. Educators and students are used to having someone tell them what they need to learn, how to learn it, and at what time they need to know and understand it by. A personalized, competency-based approach to learning changes all of these things. Learners now choose what and how they want to learn via a series of different competencies aligned to their personal career and growth plans. This can be a struggle to choose and complete your personal pathway on your own. Even with a buy-in to the organization’s vision and incentives to encourage you to show competence of your goals, obstacles may arise, motivation drops, and frustration with technology and a new way of learning can get in the way. Providing a variety of opportunities to support your educators through their learning journey is essential to the success of your implementation. Cohorted groups, mentors/coaches, working in PLCs, and provided time and opportunities to collaborate with one another are a few examples of supports that will impact the engagement, learning, and earning of micro-credentials.